I traveled to Cuetzalan in the Sierra Norte region of Puebla, Mexico in early November. 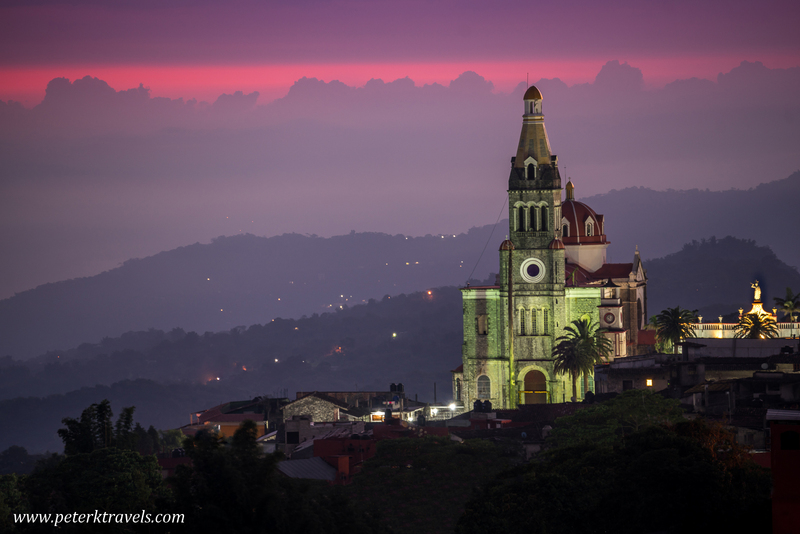 Cuetzalan is one of Mexico’s “Pueblos Magicos”, or magic towns. It’s a four-hour bus ride from Puebla. The final hour or so of the trip finishes with a stomach-churning twisty-turny climb up to the small town. Nestled in the mountains, Cuetzalan is a beautiful town. Its buildings are mostly painted white, with red trim and tile roofs. The streets are cobbled, and are worn smooth from years of use. I had hoped to get some sort of sunrise photo while I was there. Ideally, you’d get a nice shot of the main feature of town — the Parroquia San Francisco — with the sun coming up behind it. However, the direction the sun was coming up in November wasn’t ideal. It was too far south of due east, which put the sun behind some mountains and tall buildings. I decided to look for an alternate view. I hiked out-of-town uphill, until I hit the highway. I walked out the highway a bit and found a view that I liked that showcased the church. The following morning, I got up before dawn and hiked back up. I was rewarded with some beautiful pink hues in the morning sky as the sun began to rise. I quickly took a few photos, the best of which is below.